animated video templates which can be edited directly. 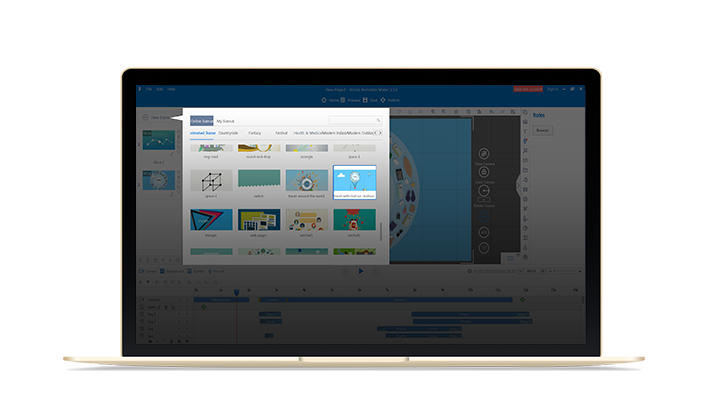 After create an empty Animiz project, you can begin to design and create your own animation video project. 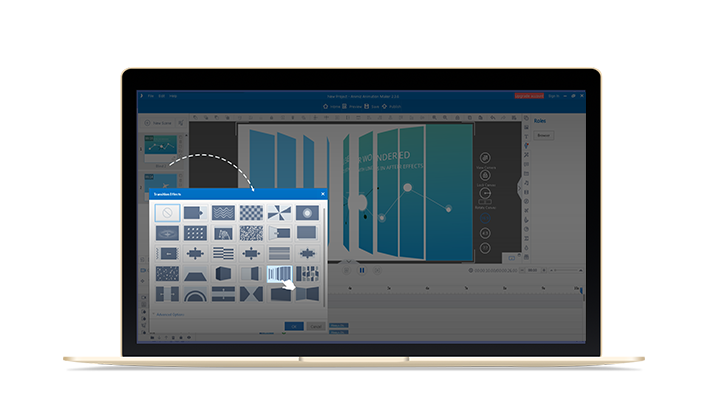 Under the condition that you don’t want to spend much time on designing the layouts, it is so wise for you to pick out one in the library of scene templates. There are more than 300 options from different fields for you to choose from. After applying to your project, you can begin to replace the contents with yours, such as the texts. Or you can add more other elements to better your scene. While there are more than two scenes in your project, you can consider adding scene transition effects to better connect the contents of two scenes. There are 30 transition effects available for you. According to the scenes’ contents, choose the matched transition effect to embellish your video. All of the transition effects can be used for free, helping your video be more smoothly, clearly and naturally. As for an impressive animation video, subtitle and voiceover should not be left out. The most important function of subtitle and voiceover is improving intelligibility. It is so easy to add subtitle with the help of Timeline. 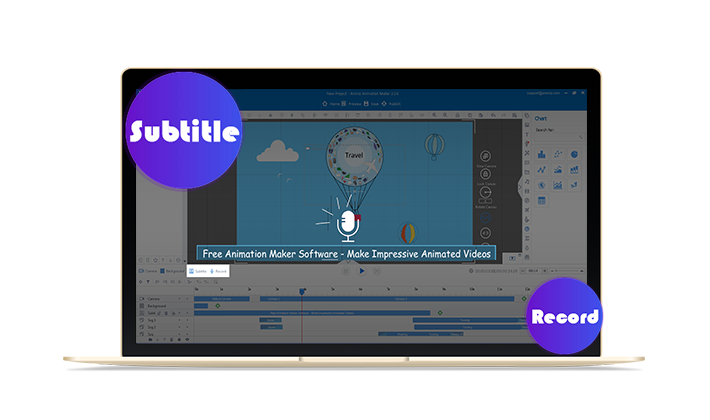 Customize the font, size and background color of your subtitle to make them much more outstanding in the video. According to the subtitles, you can begin to add dubbing for them. These two settings would simply improve the attraction of your video. 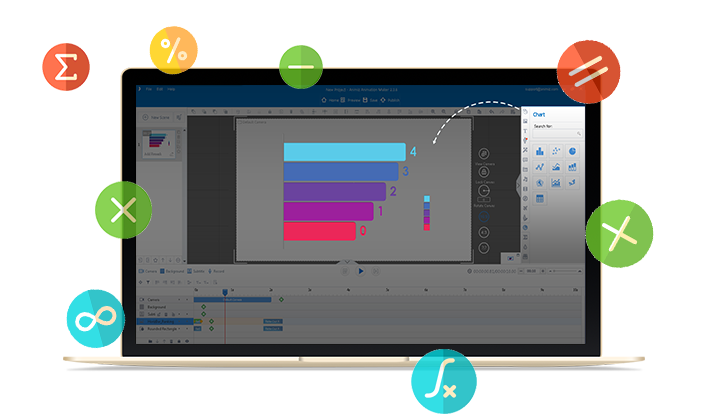 As the free animation maker software, Animiz makes it easy to add charts and formula for the animation video. Charts and formula are sure important to most of the video presentation especially the statistic-based ones. Firstly, pick put one kind of the chart and customize the data with yours. The professional chart would be made. Secondly, Animiz offers a formula editor for users. Add and customize formula easily.